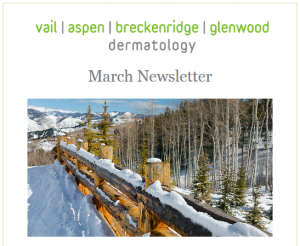 "Skin with Altitude" is a newsletter brought to you by Vail | Aspen | Breckenridge | Glenwood Dermatology. We are celebrating our 14th year! Our practice continues to grow by referrals from our loyal patients.Thank you for your trust in us. We would love to hear your questions, comments, and concerns - please email them to info@vaildermatology.com. We are also on Facebook - visit us to hear about our specials and the latest in skin research.